LOS ANGELES – First 5 LA, a leading early childhood advocate and public grantmaker, today formally announced the launch of a new, innovative Family Strengthening Public Awareness Campaign and Parenting website. The multiyear effort will help Los Angeles County parents and caregivers by providing them with vital, user-friendly tips, ideas and resources to give young children their best start. “Parents and caregivers are at the heart of a child’s development and we want them to know that they are not alone in their efforts” -Kim Belshé. This first phase of the Family Strengthening Public Awareness Campaign will focus on the benefits of social connections and encourage caregivers to implement positive changes in their day-to-day interactions with their child, social networks and community. In addition to a countywide presence, campaign ads will appear in locations within First 5 LA’s 14 Best Start communities – acting as a complement to ongoing programs and services currently being offered to families. Other unique aspects of the effort include messaging for diverse populations with advertising created in English, Spanish, Chinese and Korean. Today was also the formal launch of First 5 LA’s new parenting website, an online resource hub designed for parents and caregivers. 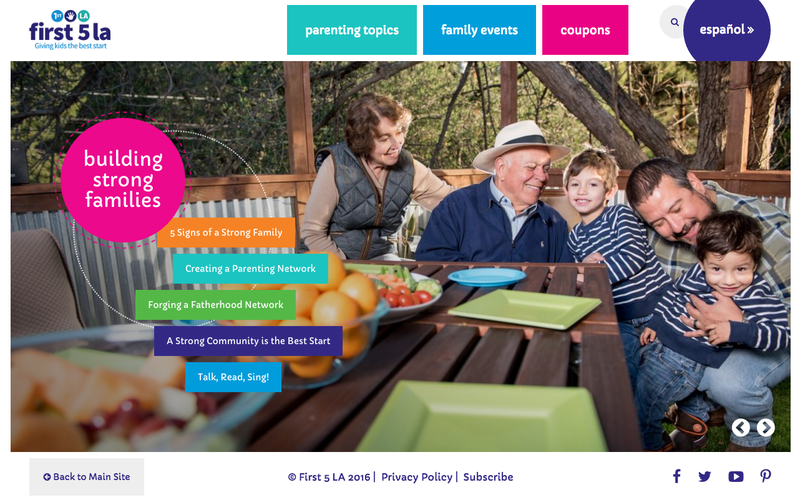 Based upon research into parenting needs in L.A. County, the site features a calendar with free and low-cost family-friendly events, exclusive coupons for kid-friendly venues such as the L.A. Zoo and California ScienCenter, and originally-written and researched articles on a variety of early childhood development topics. The site also offers an “Ask a Parent Coach” feature where parents and caregivers can submit questions and get advice tailored to their needs on 20 topics. The parenting site was built with mobile users in mind, making all of the features accessible and easy to use on smartphones and tablets. Research shows that parents and caregivers rely on both personal sources such as friends, family, pediatricians and digital sources such as parenting sites, sites sponsored by trusted organizations, and Facebook to receive information about parenting. Parents learned about reliable digital sources from their personal networks including friends and other parents. Most parents used smartphones far more frequently than laptops, desktops or tablets to receive information. Joining First 5 LA at today’s announcement was Matthew Melmed, Executive Director of ZERO TO THREE, a nonprofit organization dedicated to helping infants and toddlers thrive. The nonprofit recently commissioned a national survey to gain a clear and in-depth understanding about the challenges that parents face, the help they seek and how satisfied they are with the support they receive. First 5 LA’s Strategic Plan puts parents at the center of its work. The Family Strengthening Public Awareness Campaign draws from what research has shown is the pathway to building stronger families. The five “Protective Factors” that support healthy children and families include (1) parent resilience and stress management, (2) the presence of positive social connections, (3) a better understanding of how children develop and how to best support them as they grow, (4) the ability to raise children in a nurturing environment, as well as (5) a caregiver’s ability to access support in times of need. First 5 LA’s parenting website is www.First5LA.org/Parenting.